We are the manufacturers of Epoxy Fiberglass Sheets of Fabric Base of Grade EPGC01, EPWR01, EPGM01, G10, G11, Fr4, UPGM01, UPGC01, SMC30, PHWR01. We are the manufacturers of Epoxy Fiberglass Sheets of Fabric Base of Grade EPGC01,EPWR01, EPGM01, G10, G11, Fr4, UPGM01, UPGC01, SMC30, PHWR01. 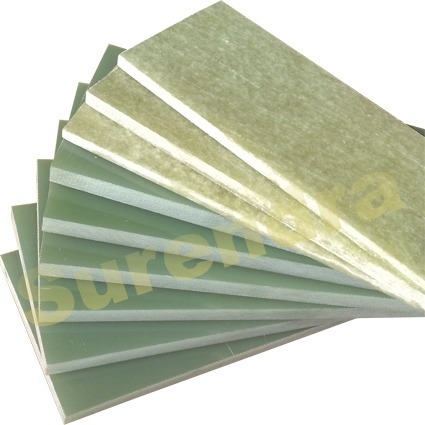 We have a wide variety of Electrical Insulating Materials like Epoxy Fiberglass Rod, Epoxy Fiberglass Tubes And Cylinders, Pre Compressed Pressboard, Densified Laminated Wood Boards & Parts, Phenolic Laminated Sheets, Epoxy Fiberglass Laminated Sheets, Pultruded Profiles and Fiberglass Laminates made on CNC machine with a capacity upto 1300 mm dia and 3600 mm length, hot cured and with turned OD finish. We also offer 'B' stage impregnated glass prepregs. Machined insulation details for large power transformer, EHV equipment, switchgear, large electrical machines, traction motors etc. We specialize in production of slot wedges for AC machines. We have our export sales in UAE, Kuwait, Germany, USA, Nepal etc. Today our board size in wood based, paper based and fiberglass based laminates is the biggest in India.